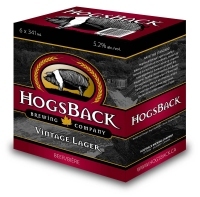 OTTAWA, ON – HogsBack Brewing Company is getting set to release their HogsBack Vintage Lager in bottles for the first time, after offering it as a draught-only product since it was launched in the spring. The packaging is currently going through the LCBO approval process, with an aim to have it on store shelves in six packs by mid-November. As with the draught version, the bottles will be available exclusively in and around Ottawa, although expanded distribution may be possible in the future.